David and I love the Mediterranean. It suits me especially because I love the sea, but I'm a real scaredy-cat when it comes to waves. It's not that I'm not a good swimmer, it's just that I was born way inland and the sea, I believe, demands some respect! So each year when we visit Europe we try to take a holiday from our holiday and visit an island. Sardinia was our choice this year. Our second visit to this little paradise confirmed that is is just right for us - the sea is warm and clear with lovely snorkelling, there are mountains with big, unspoilt places to explore, lots and lots of rock climbing by the sea, old villages to sketch, and new BASE jumps to open. And the people are warm and friendly. Perfect! Pedra Longa - a limestone rock tower by the sea. We climbed this one morning. The other side to my sketch. Pedra Longa from the top of Punta Giradilli. 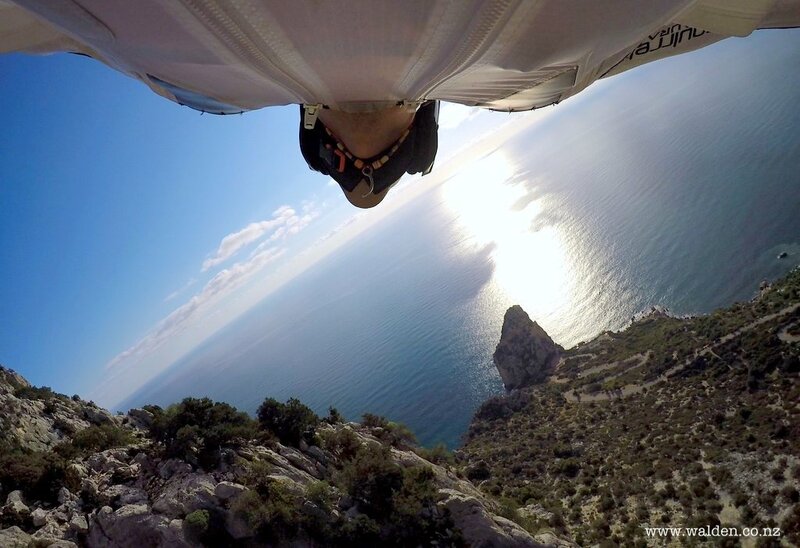 A very special place to make a BASE jump from, with landing on a beach by the sea. David jumping from Punta Su Malone with a view of Pedra Longa. Red granite sea stacks near to Cea. In the back streets of Baunei. The little stone building is a for sale and a nice 'little' fix-me-upper for someone keen. We're boring everyone at the moment with constant photos, stories and videos. We know we want to go back next year. Who's in? Recently I left the boys in the mountains and hopped on a train to Venice. Just me, my sketchbooks and paints, for 2.5 days of sketching. Well ... not just sketching ... also lots and lots of walking and getting lost. David and I were last in Venice 20 years ago. I was really blown away by the place, loved every minute of it - it's so very unique. But I wasn't doing any painting back then. So imagine just how perfect Venice is for me now. I love to paint interesting, old, European buildings. And Venice has about 10 lifetimes of these. But it also has a number of other challenges I had to get my head around - boats, water, and people. And they just won't stay still! People you can make a composite of, or cheat a little from memory. But it's pretty annoying when you're half way through a boat and someone moves it! And they do. A lot. It's easy to forget from tranquil looking photos and paintings of Venice that the canals are 'streets' and the boats are 'cars'. There's constant action, and I had to get used to that. I also had to get used to getting lost. Since I was on my own I made myself a deal I'd be back at the bus stop before dark each night. Of course, I broke it on my very first night. And got lost. Hopelessly lost. You know you're really lost in Venice when you see cars! Luckily some nice young students rescued me and walked me to the bus station. The next day I bought a better map and got lost straight away. So I thought ... that's just how it's going to be. Plenty of spots to sketch, so just I just drew wherever I was. I do have a bit of 'crowdophobia'. Yes, I know, not the best phobia in Venice. So although I did visit the major sites, I didn't stop to sketch these. There were plenty of quiet spots, so my preference was those. Below are the 9 sketches I did in the 2.5 days. I'm already looking forward to another visit. And I took heaps of photos ... it just may be that for the first time I'll be inspired to work from photos. We'll see.